Constructed to commemorate World War I, World War II and the Korean Conflict. It was dedicated on November 11, 1993, sponsored by the Canadian Merchant Navy Association and assisted by the Armed Forces. 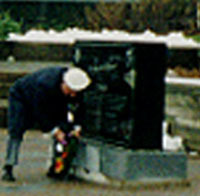 On October 22, 1993, the Merchant Navy Memorial was mounted at Sackville Landing, Halifax. It was sponsored by the Canadian Merchant Navy Association with donations from Canadians. The significance of the memorial is that it honors the memory of thousands of Canadians who volunteered their service and lives for their country in wartime, which occurred half a century ago. The Merchant Navy provided a vital role in the Allied success of World War II, by carrying troops, food, fuel, and war supplies overseas to the armed forces and civilian population. The black rectangle-shaped African granite monument on a gray granite base is nearly six feet long, four and a half feet high and weighs over 5,000 pounds. Both sides are engraved with various marine symbols. Conspicuous is the S.S. Point Pleasant Park, a 10,000-ton Parkship, built in Canada and torpedoed off the coast of West Africa in World War II. "Canada" is in large block letters. "Mother Earth" in upper right corner is depicted by a six inch terrestrial sphere, displaying North and South America, Atlantic and Pacific Oceans. The Canadian Merchant Navy insignia, worn in wartime as a lapel pin, is in the upper left corner. Both official languages describe the memory of 2,200 known Canadian Merchant Seamen and 91 Canadian vessels lost by enemy action and those who served in World War I, World War II, and the Korean conflict. Two anchors at bottom corners depict a destroyed vessel at rest on the ocean floor. A rope border inside the perimeter represents the continuity of seamanship and the marine profession. Engraved in the rear is a similar rope and then names of 24 Canadian vessels lost in World War I and 67 vessels lost in World War II. A time capsule, a 3" x 12" insulated cylinder, containing various items is fitted inside a stainless steel vacuum sealed four inch pipe. Contents include Senate Report "It's Almost Too Late", letters from three levels of government, C.M.N.A. membership, a set of 1993 Canadian coins, M.N. Report, copy of "Red Duster" and front page of the Chronicle Herald, September 23, 1993. Captian E. Wagner designed the memorial. Professor Horst Deppe produced the drawings. Commander Tony and Jane Law were artistic consultants. Heritage Monuments, Windsor, Nova Scotia, manufactured the memorial. On November 11, 1993, Merchant Navy Memorial remember and honor all those men and women who served their country in World War II. The special significance is the memory of 2,200 known Canadian Merchant Seamen and 91 Canadian vessels lost by enemy action and those who served in the cause of freedom, commemorating wars of this century.